Police, on Wednesday 05/11/2016, raids on suspected terrorist hideouts in Tunisia left 4 officers and at least two suspects dead. Two militants were killed and 16 were arrested. Security forces gave little detail on the raid or the terror plot but said they had captured a number of rifles, grenades and other weapons. Forces carried out a separate raid in Tataouine in southern Tunisia. Four policemen were killed when one of the militants set off an explosives belt. 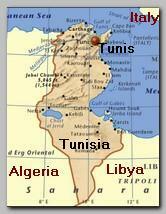 The Islamic State is well positioned in nearby Libya, which is used as base of operations against Tunisia .